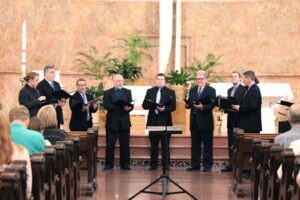 SMWC is home to three renowned vocal ensembles which perform each semester in the beautiful Church of the Immaculate Conception on campus. Both are directed by Grammy-nominated artist Michael B. Boswell, Director of Choirs. The Saint Mary-of-the-Woods College Chorale is a non-auditioned female ensemble typically comprised of approximately 35 students from various academic disciplines. The group performs repertoire from various genres and is open to any student who enjoys singing. Chorale currently takes a regional tour each spring semester and performs three concerts each school year in addition to special performances at campus liturgies, ceremonies, and community events. The Saint Mary-of-the-Woods College Madrigals is an auditioned chamber ensemble of female singers interested in performing more challenging, often a cappella, choral selections. The Madrigals have performed in Carnegie Hall, Lincoln Center and other locations throughout the United States, as well as Canada, Germany, Austria, Italy, and at the Vatican. In May 2012 the Madrigals traveled to France and performed at Normandy Beach, Mont Saint-Michel, Chartres, Paris, and special historical landmarks such as the birthplace of the College’s foundress, Saint Mother Theodore Guerin. The Saint Mary-of-the-Woods College Woods Vocal Ensemble is a non-auditioned mixed ensemble, incorporating male and female singers. Although most members of the WVE are music majors or minors or music therapy majors, other students may participate as well. 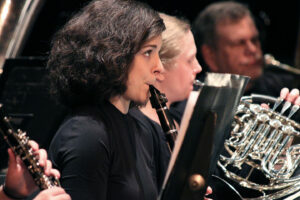 The Saint Mary-of-the-Woods College Band is a wind band for music and non-music majors. It is open to any and all who have an interest in band music. The SMWC Band performs as a pep-band at school athletic events and performs two concerts per semester.